I’m a photographer and my HTC Desire is the one camera I always carry with me. Unlike many of my fellow photogs I have forgone the iPhone and opted for an Android phone instead. This two part post covers my experience choosing the best method for getting media from my phone into Lightroom , and how this process differs from other phones. The intent is to find an import workflow that is quick and reliable so I can spend less time managing and more time creating content I’m interested in. My HTC Desire can capture photos, video and voice notes using the software that came pre-installed. While Lightroom does have some limited ability to support audio files (as sidecars to photos) it is unable to manage standalone .amr voice note files, so for the remainder of this discussion we will be focussing only on photo and video media. Your main options for making an Android phone’s content available to a computer are Sharing, your handset’s included synchronisation software, or accessing the content as an external Mass Storage Device either directly from Lightroom or via a third party import application. The synchronisation software provided varies from company to company and on my HTC phone the software is known as HTC Sync. Samsung and other vendors provide their own equivalent but the rationale used in evaluating the options should still be relevant. Most synchronisation software has similar capabilities so the discussion here should help you to make your own informed choice. The Android Market contains a number of applications providing ways to export images from your phone to third party services. Adobe Photoshop Express is one example and can export images to Photoshop.com, Facebook, and TwitPic. These applications can be useful in their own right but they do not assist the Lightroom import workflow so have not been considered here. Video can be the Achilles heel of many of the import mechanisms mentioned below. If you are considering recording video on your phone then choose your import mechanism wisely, and part two will discuss the preparation of video for import into Lightroom. Many Android applications (e.g. 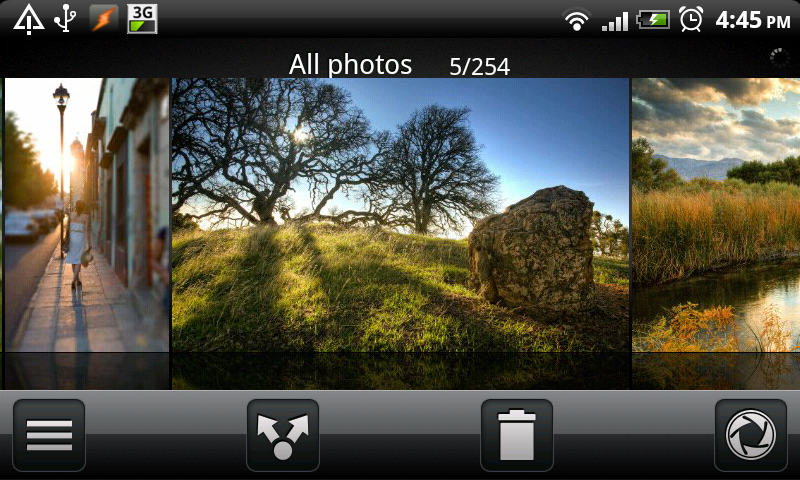 HTC Desire’s Gallery application) provide a sharing option when viewing a photo or video. Selecting this option lets you chose from a number of mechanisms for sharing items with other people or services. This is great for quickly sharing individual items but not terribly useful as the basis of a reliable import workflow for Lightroom. Selection of content to share is manual increasing the chances you will miss files unintentionally. It also requires a secondary service such as Dropbox or Bluetooth to transport the files to an location accessible by Lightroom’s Import dialog. Other options such as email can be used but require more manual processing to detach the files and store them somewhere Lightroom can access. Sharing is best used for quickly getting individual photos or videos off your phone and somewhere others can see it. The manufacturer’s preferred synchronisation software is included with most Android phones. It is typically used for synchronising Calendars and Contacts between a computer and phone. For HTC devices this is the Windows only HTC Sync application, and the last major release (version 3) introduced the ability to synchronise photos and videos back to your computer. To take advantage of this feature enable the “Copy device Camera Shots to PC” option in the Gallery synchronisation options. From then on HTC Sync will copy all photos and videos taken by the device into a pre-defined sub-directory in Documents or My Documents. This is convenient because it prepares your images for import into Lightroom automatically every time you synchronise the phone. Other brands offer their own syncing software so users of handsets should have an equivalent option available to them. This was originally my preferred import option but HTC’s synchronisation software has one issue that makes it unworkable for my video workflow. During the file copy process it resets all of the date/time stamps for the files and replaces them with the time they were synchronised to the computer. For images this is a minor nuisance because the EXIF metadata is unaltered and contains the relevant dates. Unfortunately video files do not have an equivalent of EXIF metadata so once those date/time stamps are lost it becomes difficult to impossible to determine when those videos were taken. This interferes with my preferred file naming scheme and is a “show stopper” issue for me. Synchronisation software from other manufacturers might not have this flaw but please verify this yourself before entrusting you video import workflow to this option. One of the simplest options for importing your files into Lightroom is to connect your phone and computer via the supplied USB cable, switch the connection to the “Disk Drive” type, then start Lightroom’s Import dialog and wait for it to detect the phone. The Micro SD card should soon appear in the dialog just like any other external USB device and the photos and videos will be found in its DCIM folder. As you are accessing the content directly from the memory card the dates and times recorded for the content will remain intact, so the video file renaming workflow should now operate correctly. Unfortunately a new problem quickly becomes evident. 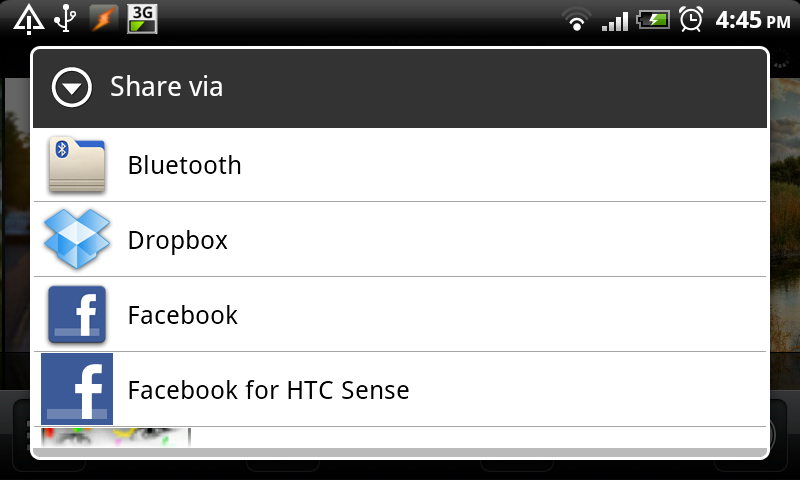 Lightroom doesn’t recognise the HTC Desire’s video files so refuses to import them. The HTC Desire includes a number of different modes for recording videos but all store the files with a .3GP file extension. Lightroom does not currently recognise this as video and will not offer to import the file. This impacts not only HTC phones but also those by other manufacturers (e.g. Motorola), and even other phone operating systems (e.g. the PalmOS use by my old PalmOne Treo 680), that choose to save their videos with this file extension. If your phone uses .3GP or .3GPP as the extension for its video then Lightroom will ignore the files so cannot be used as the import mechanism. The easiest way to work around the Lightroom Import dialog limitation is to use a third party application to copy the files to disk first. I currently use this approach and the Image Ingester 3 product to import my files. While this adds another step to the importing process it also grants some flexibility (e.g. more extensive file and folder renaming options) and ensures all of your images and video are imported onto your computer regardless of their filename extension. Once on your system you have options to prepare your videos for import into Lightroom via its Import dialog. More information will be provided about the preparation process in part two of this post. After reviewing all the options presented the decision making process becomes fairly straightforward. It all depends upon your interest in video and the capabilities of your phone. If you don’t currently, and never will, capture videos on your device then using your phone’s native synchronisation software (e.g. HTC Sync) or Mass Storage Device mode (via Lightroom’s Import dialog) to import is the simplest approach. The limitations mentioned above don’t impact an image only capture workflow, but if your workflow ever does expand to include video you will need to quickly change your import approach or risk losing valuable video metadata. If you do capture video, take a quick sample with your phone and verify what file extension it produces. If your phone is a Samsung Galaxy S or any other phone that shoots AVI, MP4 or MOV videos (yes, even an iPhone) then use the Mass Storage Device mode (via Lightroom’s Import dialog) to import. It is the next simplest way to retrieve the media from your phone, retains your video date/time metadata, and Lightroom will recognise your video files so this option should support your video workflow. If your phone produces .3GP or .3GPP video files you will need to use the Mass Storage Device mode (via third party import) option to maintain your video date/time metadata and ensure these video files ignored by Lightroom aren’t lost. My tests with colleagues’ Android phones indicate at least some HTC and Motorola users will need to take this approach. Once the video files are safely store on your computer you can then prepare your video for import into Lightroom. If you fall in the last category then please stay tuned for part two of this post, where I will describe the process of getting your .3GP video ready for processing by Lightroom. I use Downloader Pro to ingest my files. But the part that drives me crazy is that every camera app on the phone stores its files in a different location so the files are spread out all over the place? Internal memory, internal sd card, external sd card… very annoying! @Sean, Just did a quick test and Downloader Pro v2.24 recognises .mov, .mts and .mp4 files but ignores .3gp and .3gpp files. Now that is annoying. I use the inbuilt camera app so don’t have that particular problem. I do all my processing in Lightroom and don’t want the camera app to do anything “smart” to my images before I can get them into a program I trust. That’s unfortunate about DLP. It’s a great program otherwise. I mostly use my phone for quick and fun pictures and don’t worry too much about image quality, so I like to use vintage camera apps and other fun styles… The image quality isn’t very good to begin with (especially since I rarely clean the lens) so I really can’t be too bothered by what the apps might do to the files. Having said all that, I still like to catalog and store them, so everything does end up in Lightroom eventually. @Sean, data plans aren’t that great in Australia so I end up waiting till I get back on WiFi before uploading photos. By that time I’m near a computer so might as well do the edit/upload there instead. Its interesting how much our workflows can differ over something as simple as an affordable data plan. Question, not sure if this is really the place to ask it? I’m considering buying lightroom mainly as a way to organize photos. My biggest question though is wanting a program that will recognize dates and sort appropriately. I have photos on many cards that I’ll be uploading. For example my biggest concern is baby photos. We have photos on 2 Droid phones and our SLR. Suggestions or thoughts on how these would sort if I used Lighroom? Thanks much in advance! @Autumn, I’m familiar with this problem. We have two phones and three cameras that are regularly used to take kid photos and sorting them can be fun. The biggest challenge is remembering to keep the camera clocks up to date. If you remember to swap them over at the start and end of daylight savings and check your SLR clock semi regularly that will be the biggest step you can take towards getting photo sorting right. Getting into a routine (e.g. check SLR’s clock after every import) will help you to remember. The Droids should look after themselves because they will likely maintain their time according to the phone network. If you do get your camera time wrong then Lightroom will allow you to change the capture date for a group of photos after importing but that can mess with your filenaming scheme so best to get it right in camera. Once you have the camera/photo times correct sorting is a breeze. Capture date is the default sort order in the library and as long as your different camera clocks reflect the actual time then their photos should sort correctly.